In a previous article we talked about the specific part of the visual routine that helps build confidence in the braking zone and as you move into corner entry. In this article we’re going to move onto the specifics of what we do with our eyes from mid-corner out to corner exit and the benefits it brings us there. The technique we’re about to talk about here is so incredibly simple that it almost doesn’t warrant an article of its own, but if you haven’t been doing anything like this before then this simple tweak to your visual routine could bring massive gains for you at corner exit, which is why I want to make you aware of it. So let’s get straight into the simple routine itself, then we’ll talk about why it can be so beneficial. Like I said, the basics of the routine itself are very simple. As you’re moving through mid-corner toward your apex you will be focused on that apex as you approach it. 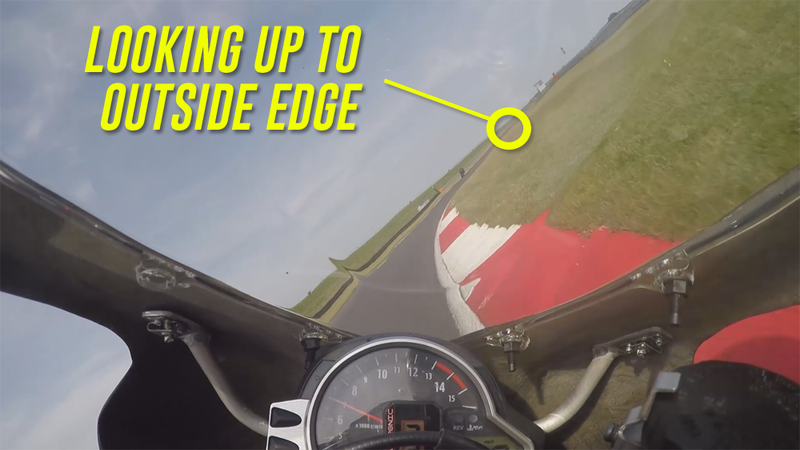 Once you’re close enough that you’re sure you’re going to hit the apex, move your eyes up and out to the exit. That’s it. Now, what “close enough” means to you could be different to another rider, and it can even change depending on the corner itself. Initially this may only be 1-2 bike lengths, but in some situations and as you gain confidence in how your bike holds a line you may start to extend that a little. That being said you don’t need to go too far with it. Remember that we want to be focused on our apex so that we hit it correctly. Looking through the corner to the exit too early is likely going to make that more difficult. Where Should You Look at Corner Exit? What you use for your exit marker can also be different from rider to rider. Where the apex is more about hitting a very specific point to create the potential for a good line out of the corner, as we move out to the exit it’s more about judging the space we have, meaning the way you do that can have a little more flexibility. For this reason you won’t necessarily be looking at the exact point where you want to meet the outside of the track. For instance you may opt to look just a little way down the track and focus on the white line as you exit the corner (I often take this approach, pictured below). If you’re exiting onto a long straight then you can also opt to look as far down the track as you can, using their peripheral view to monitor the outer edge of the track. Though this approach is a little more difficult if you aren’t as confident in how your bike naturally moves through the exit, or if you aren’t as good with using your wider vision. Basically you want to look at a spot that helps YOU best see the space and judge your line through corner exit so that you can more effectively use the space you have. Something to avoid, however, is looking at the outside of the track too close to the corner. 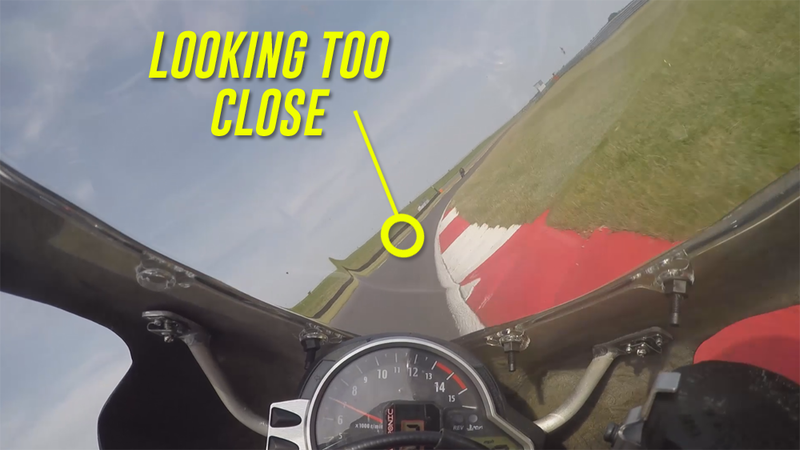 Once again you’re going to be restricting your view of the the available space and you may even begin picking the bike up too soon, causing you to pause your exit drive and wait longer for the bike to turn and point up the track. What if the Corner Doesn’t Exit Onto a Straight? There’ll be many instances where the corner you’re travelling through is closely following by another corner. It’s in these places that you have to be mindful of your line out of the current corner so that it doesn’t spoil the next one. In these situations the advice is pretty simple. Look where you want to put the bike so you can create the desired line. 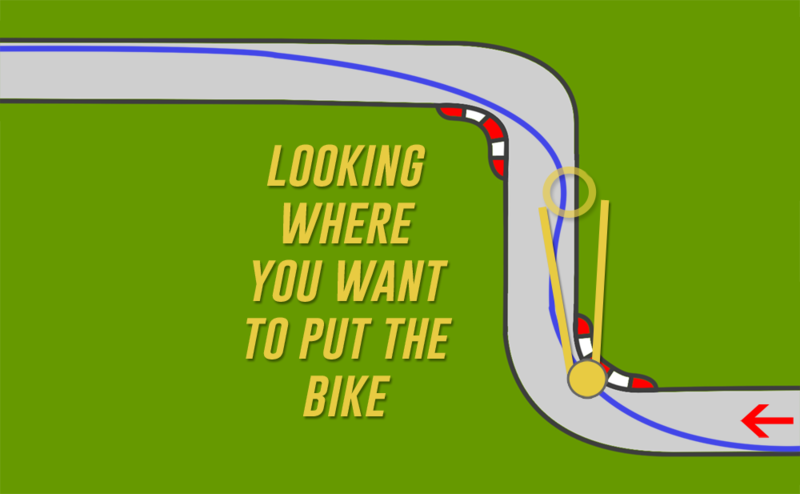 For instance, if you’re going through a right – left combination where the left exits onto a long straight, it’s the exit line of the left that is most important, so we want to keep the bike to the right and not use all the track on the exit of the first corner so we don’t spoil the line through the second one. Once again we’re looking where we want to put the bike. Always think about the line you want at corner exit, then find an object or area to focus on the helps you see the space and visualise the line through it. The biggest benefit for learning riders is that it often means they can begin picking the bike up earlier, which means they can apply more throttle in the exit phase earlier too. But does it matter than much? Well for starters, when travelling at 70mph you are covering a massive 31 metres per second. If we’re generous and say that a rider takes 0.5 seconds too long to look up and out to the exit, they would have travelled 15.5 metres before seeing the space at corner exit. This means they could have potentially started picking the bike up and driving harder 15 metres earlier. That can make a big difference heading out onto a long straight , especially on more powerful machines. And this is all assuming the rider that’s half a second late is looking at the correct thing in the first place. With a correct view of the space at corner exit is makes it a lot easier to visualise the line you’re looking to take, and as a direct result of that you can make much better decisions on when and how quickly you stand the bike up so that you can drive out. For riders who have never adopted this before, this typically means substantial gains in corner exit drive in many places across the track they ride. For that reason I’d suggest you take an audit of what you’re doing with your eyes at corner exit to see if you can tap into those same substantial gains.